Tucson police officer Brandon Tatum attended Saturday’s Donald Trump rally in Tucson on Saturday as a curious civilian. What he witnessed shocked his conscience so much he recorded a video to describe his experience as a Black man at a Trump rally. Tatum described violent protesters tackling Trump supporters, getting in Trump supporter’s faces, loudly yelling ‘Black lives matter!’ and swearing such that parents had to shield their children from the protesters. He also said the Trump supporters were not racist toward him as an African-American man, contrary to media portrayals of Trump rallies. 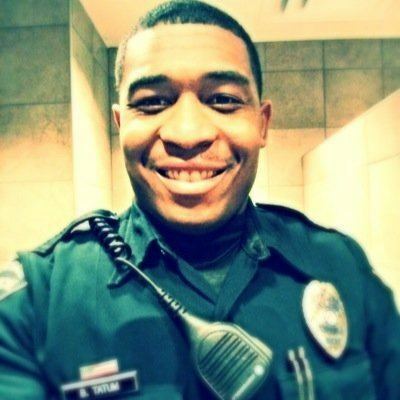 Officer Brandon Tatum, image via Twitter. Tatum posted the 10:29 video to Facebook Saturday night. The video has over 70,000 views as of Sunday afternoon. The video was subsequently reposted to YouTube. Tatum stated he attended the rally out of curiosity to learn for himself what was happening at Trump rallies. The anti-Trump protesters were “…verbally violent at the door, yelling ‘EFF Donald Trump’. I mean being outrageous. Um, a very very uncomfortable feeling. I mean people were directly yelling at me as if I’m a criminal. And all I’m trying to do is hear what the man has to say. I didn’t wear anything supporting Donald Trump. I was very neutral with this black shirt and khakis on. Video by KVOA’s Domenica Fuller shows anti-Trump protesters screaming in close quarters at rally attendees as they enter the arena separated by a line of police. The man wearing the American flag shirt who was later beaten inside the rally can be seen harassing Trump supporters. Tatum says the Trump supporters did not act racist at all toward him. He blended in the crowd and for awhile was quite comfortable. What shocked and scared Tatum–even as an experienced police officer–was the ‘evil’ behavior of the hundreds of Trump protesters inside and outside the arena. “During the event, I mean these people were acting a fool. I’m talking about cussing and screaming. You guy’s seen some pictures. There was somebody wearing a Ku Klux Klan hat, saying ‘Eff Donald Trump,’ flipping people off. The group that I posted were yelling ‘Eff Donald Trump!” in front of these kids. They had families down there, I seen this one lady covering her daughter’s ears. Because the people were just outlandish and out of control. Tatum said that even as an experienced police officer he was afraid at times and was fearful that the protesters would sucker-punch him. Tatum praised the restraint of Trump supporters in the face of the outrageously provocative behavior of the protesters. The other incident of Trump supporter violence Tatum saw was an older man who took a “racist” flag away from a young protester and throw it over a balcony. Tatum described the flag as white with ‘Trump is a racist’ and slurs written on it. Tatum commented on the overall restraint of Trump supporters and Trump himself and how he was treated by the Trump supporters. But you know what’s funny is the media will take a picture of that and hang on to that. When it was a thousand other people that should have been kicking these people’s tails because they were all in people’s faces and everything. It was crazy. Um, but they, they were restrained and it wasn’t violent. The violence was coming from these protesters that they eventually kicked out. Some they couldn’t even kick out. They were locking arms and they were yelling probably sixty percent of, of Trump’s, um, of his speech. I mean he ignored ’em. And he turned around and addressed ’em a couple times but he for the most part ignored ’em which is not really portrayed in the media. Um, so, that, that was my perception man. I was very, very shocked that in a disingenuous perception of Donald Trump and his followers and these hateful people. You know I had no problems with it when I was there. I’m an African-American man. I had no problems with people, um, going against me and trying to hurt me and want to kick me out because I’m not doing nothing–naw, these people were acting fools. Some of them were African, most of them were African-Americans acting a fool. I’m talking about cussing and screaming and getting in people’s faces. Acting a fool, that’s what these people were doing. I’m talking about tackling people. There was a guy trying to walk up the staircase, they were grabbing his legs. I mean it was a crap show! I’m surprised, I’m surprised, that people weren’t, I thought at some point it was gonna be a full fledged riot. Because these people were acting so outrageous until you were just thinking that somebody was going to lose their temper and it was going to be a full brawl. Or like someone was going to run up on me and just punch me in the head because they were trying to prove a point about Donald Trump. That’s how crazy this stuff was. And I didn’t feel safe some times. I, I was a little nervous, I was watching my back like ‘I didn’t know what these fools gonna do in here man’, they were crazy. They didn’t have nothing to do with Trump’s followers. They’re these other people who I was really, really feeling uneasy with man. I thought I was gonna have to punch a couple people–in self defense. I thought I was gonna have to punch a couple people, honest to God’s truth. Tatum concluded by saying he hopes the media reports on the violent, profane acts he saw committed by the protesters. Tatum also praised security and the Tucson police for doing a great job handling the protesters.